There are two key components to fixing soils. These are organic matter and beneficial microbes, or probiotics for soils. When naturally occurring bacteria are added to exhausted or leeched soils, they are extremely helpful in regenerating and rebalancing the soil. Extreme heat, drought, or flooding results in damaged soil. You may have noticed cracks in dried out soil. This is caused by moisture evaporating and leaving behind empty pockets where soil then collapsed. The soil is now tight, compacted and anaerobic (without oxygen). The beneficial microorganisms that once benefited the soil are now likely dominated by harmful bacteria, increasing the chances of sickness and disease in the plants growing in that soil. Adding organic matter to the soil promotes beneficial bacteria growth, improves oxygen levels, and enhances soil quality and texture. 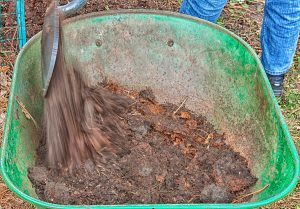 You can make your own soil conditioner with material from home by making your own compost or adding fermented food wastes to soils (bokashi food wastes), to boost plant growth and performance. Several conditions adversely affect beneficial microbes in soils. Some of these include the use of toxic chemicals, excessive use of fertilizers, or compaction. In order to grow healthy vegetables and beautiful flowers, it may be necessary to amend the garden bed with some soil conditioners. Soil conditioners are added to the soil to improve physical properties, such as water retention, permeability, water infiltration, drainage, aeration and aggregation. Soil aggregation is the clumping of soil particles. Aggregates vary in size and are held together by moist clay or organic compounds. Some particles fit together tightly, while others leave spaces or pores. These spaces are necessary for allowing the soil to store water, air, microbes, nutrients, and organic matter. The aggregates form soil structure and help keep soil lose. When soils are lose roots have a much easier time growing and expanding a network that helps the plant get maximum nutrition around it. healthy root development and depth. The ability of water to flow through soil is referred to as the soil’s permeability. Compacted and hardened soil resists water, not allowing it to reach thirsty roots. Soil conditioners are used to loosen soil and replenish and maintain nutrients. Improving stressed soil and replenishing soil that has been damaged by over fertilization, pesticides or fungicides, will greatly boost plant growth and health. The addition of a wide variety of organic materials will go a long way in supplementing the soil. The goal is to provide a better environment for roots. Over time, soil can become compacted. It is not always caused by heavy equipment. When soils are compacted, it is difficult for plants to grow because it reduces their ability to draw nutrients and water. Tight soils become anaerobic, providing a great place for anaerobic microbes to grow. This could be a potential hot spot for disease problems or an area where water will pool and cause roots to rot. The addition of a soil conditioner loosens the soil, supplying loft and texture. For soils heavy in clay, soil conditioners help with aggregation, aeration, drainage and rooting depth. Porosity and permeability are also increased. Humic acids are great for clay soils. The super-complex chemistry of humic acids helps to pry apart clay layers, allowing for root penetration, worms and microbes to get in the clay and mine the minerals the plants need. Humic acids also feed microbes and high populations of probiotic microbes mean more nutrients become available to plant roots. More microbes also mean more worms, since worms eat bacteria! For sandy soils, the use of a soil conditioner will improve the water and nutrient holding capacity of the soil. Water retention can also be enhanced in very coarse soils. Sands lack organic matter. Sandy soils could use lots of compost, microbes, humic acids and cover cropping to improve them rather quickly. Soil pH can cause problems when it is either too acidic or too alkaline. Extremes on either end (5 or below or 8 and above) will tie up nutrients, keeping them from plants. The conventional approach is to add lime with an acidic soil or gypsum or acids to alkaline soil. Although these inputs work, their effects are very short lived and offer little to no additional benefit to the soils. Again, increasing organic matter through applying compost, humic acids and microbes is a better way to go. All of these inputs will help neutralize soil pH as well as provide abundant micronutrients and metabolites that will have long-lasting effects on the soil. By enriching the soil, plants are able to grow bigger and stronger. In other words, feeding your soil will help feed your plants. Eric Lancaster is Executive Vice President of TeraGanix, Inc., the exclusive North America distributor of Effective Microorganisms® and EM® Bokashi products. He is the technical expert on Effective Microorganisms® for the US market. Please visit TeraGanix.com for more information.